Palestinian analysts and observers differ about the prospects of Donald Trump’s “deal of the century” in the wake of official Palestinian rejection of it and the suspension of communications with the US because of Washington’s clear bias towards Israel. Some are concerned the deal will go through despite Palestinian President Mahmoud Abbas, amid debate that he has overstayed his mandate, while others believe the deal cannot be sealed without Abbas’s approval, which could delay its implementation. Everyone agrees Palestinians must close ranks soon, most notably Fatah and Hamas, so they are united in the face of whatever is being hatched overtly and covertly to destroy the Palestinian cause. Mustafa Al-Barghouti, secretary general of the National Palestinian Initiative, said the goals of the “deal of the century” are obvious. Leaked reports indicate it is identical to the intentions of the government of Israeli Prime Minister Binyamin Netanyahu of voiding the Palestinian cause and the rights of Palestinians, implementing policies to annexing and Judaicise Jerusalem, annul the right of return for Palestinian refugees, and convert a prospective Palestinian state into a prison under siege in the Gaza Strip and fragmented areas in less than one third of the West Bank. This would allow Israel to annex settlements and 62 per cent of the West Bank, while the occupied territories remain under Israel’s military, security and economic control. Barghouti believes it is a deal to continue the occupation and create an apartheid state set against the Palestinians, with the primary aim of normalising relations between regional countries and the racist State of Israel. He warns that Palestinians will be told they can make their opinions known so long as they come to the negotiating table and don’t appear to be rejecting peace in the eyes of the world community. The Israelis would insist on “negotiations without preconditions” to guarantee settlement expansion, more racist laws, and changing realities on the ground in favour of annexation and Judaicisation. He noted that the US administration needs a Palestinian party to attend the talks for two reasons: first, as a cover for expanding settlements and Judaicisation; and second, normalising relations between Arab countries and Israel. “If we want to avoid the Nakba (catastrophe) called ‘deal of the century’, which will be worse than the 1948 one, we must quickly find a way to end division that has been eroding our ranks for a decade and continues to worsen everyday by creating more splinter divisions,” Barghouti said. Ibrahim Deebes, a writer, asserted Washington is continuing to push the deal of the century amid what they call an “Iranian or Shia threat”, and Israel’s new alliance with Gulf countries against it. Thus, the Palestinian cause has been shelved on the Arab agenda. Some Arab countries are trying to push through the deal of the century with some cosmetic changes, especially pertaining to Jerusalem, to eliminate the Palestinian cause and problem in order to focus on other threats. Deebes continued that they are promoting what they claim to be humanitarian aid to save Gaza, led by the Trump administration and likely funded with Gulf dollars. He asserted they do not care about Gaza or its residents, because if they did they would demand that Israel lift the siege on the Strip. They are obviously more focused on making Gaza the base for the purported state they are talking about, while Israel devours a bigger chunk of the West Bank by holding onto settlements and annexed land under its “sovereignty”. Meanwhile, Old Jerusalem would remain under occupation and Jordanian or other custodianship, including holy sites such as Al-Aqsa Mosque and the Church of the Holy Sepulchre. Deebes believes “say no” is not enough and the status quo must be remedied, most notably ensuring inter-Palestinian conciliation and participating in political action instead of boycotting and grandstanding. Abdel-Latif Mehanna, a Palestinian writer, said the purpose of cutting funds to the Palestinian Authority (PA) and UNRWA, and statements by Netanyahu in Amman about continued Hashemite custodianship over holy sites, is to put pressure on the PA to reverse its position rejecting any deal after the US relocated its embassy to Jerusalem. As an incentive, there are leaked reports reassuring the PA that a “peace plan” based on negotiations would be proposed, not a solution that will be forced on Palestinians. Also, that Abbas is the only Palestinian negotiator and will not be overstepped. 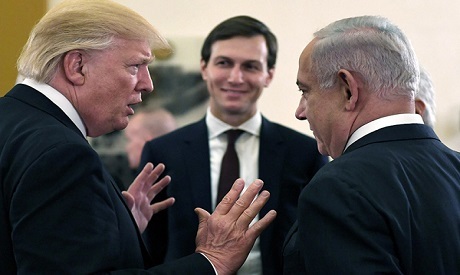 Informed sources in Washington said US officials Kushner, Greenblatt and Friedman agree with Netanyahu that “the plan does not mention a two-state solution for moving towards peace between Israel and the Palestinians, and will not mention [occupied] East Jerusalem as a location for Palestinian sovereignty or declare it as their future capital. There are secret talks between Palestinians and the US, with Israel’s knowledge, about a bundle of “initiatives” by Tel Aviv and US efforts to encourage Palestinians to return to the negotiating table. An informed diplomatic source said Kushner and Greenblatt, who are on a regional tour, briefed Netanyahu about ideas that could be offered as incentives for Palestinians to return to talks. They include granting the Palestinian leadership a role in plans to reconstruct the Gaza Strip, which are almost ready. The diplomatic source added there is an idea to open a US consulate in East Jerusalem focused on Palestinian affairs. The source said the so-called “deal of the century” is not yet ready, and unveiling it needs the Palestinians at the table. Haaretz newspaper reported that Trump’s plan to settle the Palestinian cause includes Washington offering to the Palestinians a village called Abu Dees as the capital of their future state, instead of Jerusalem. In return, Israel would withdraw from three to five Arab villages north and east of Jerusalem while the old town remains under Israeli occupation. Earlier reports stated that according to the US vision of the peace plan, in the first phase Israel would disengage from four districts in occupied East Jerusalem: Shaafat, Jabal Al-Makbar, Esawiya and Abu Dees, transfer them to the PA and disconnecting them from Jerusalem. Amos Harel, a military analyst at Haaretz, said the anticipated “deal of the century” does not guarantee the evacuation of settlement outposts in the occupied West Bank, including “isolated” settlements. Also, the Jordan Valley region would be under complete Israeli occupation. The newspaper added that the Palestinian state, according to the US vision in the deal of the century, would be a “quasi state” without an army or heavy weapons, in return for what Harel described as a “bundle of huge financial incentives” granted by Saudi Arabia and other Gulf states. As for the humanitarian crisis in Gaza, MP Jamal Al-Khodari, who is chairman of the Popular Committee Against the Siege, said several steps are needed to overcome the “difficult and dangerous reality” in Gaza. These include ending the siege completely, which means opening all crossings for trade and people and allowing imports and exports without restrictions. The next step, continued Al-Khodari, is to open a “safe corridor” between Gaza and the West Bank to facilitate the movement of people, quickly rehabilitate and reopen Gaza’s airport and initiate a maritime corridor connecting Gaza to the outside world in preparation for constructing a port in Gaza. He also stressed the importance of creating job opportunities for Palestinians to reduce unemployment rates and open foreign import markets for Gazan products. Al-Khodari also focused on the importance of Palestinian unity as the safety valve for ending Palestinian suffering, whether in Jerusalem due to Judaicisation and raids of Al-Aqsa Mosque, or in Gaza, which is under siege and aggression, or in the West Bank where there are continuous settlements, and a racist segregation by means of wall and barriers. He stressed that Palestinian unity “is the true foundation for our Palestinian people to create our own independent Palestinian state with Jerusalem as its capital”. Al-Khodari also called on the world community to “quickly work on addressing the humanitarian crisis in Gaza caused by the siege”. He noted that humanitarian conditions in Gaza are worsening by the day, especially health conditions, poverty levels, unemployment, water and power problems. He added that all these problems worsen daily in the absence of real intervention to resolve them. *A version of this article appears in print in the 28 June 2018 edition of Al-Ahram Weekly under the headline: Deal of the century despite Abbas?